“Manila Zoo?? Buhay pa ba yun? (Is that still open? )” That’s the resounding question I got when I told people that I had gone to visit the old zoo. “Why not so and so zoo?” “It’s so much nicer at the other zoos.” “Yes, a lot of nicer animals at so and so.” “There’s nothing much to see and do in Manila Zoo, right?” They went on saying. Unknown to many, inside the 55-year old state-owned zoo is a privately owned half hectare of land called Kinder Zoo Adventure Jungle. 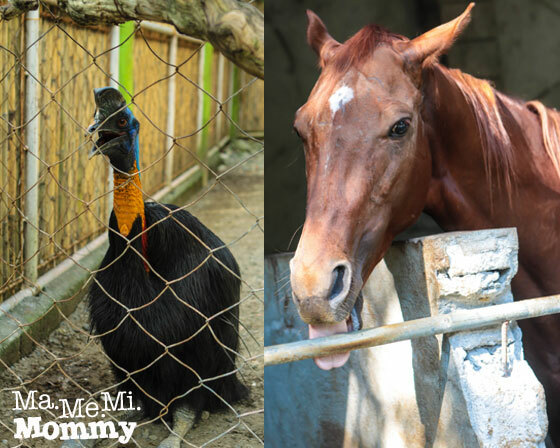 Owned by GMA Network’s CEO, Joel Marcelo Gozon Jimenez, Kinder Zoo is an interactive zoological facility that features exotic animals that can be held and fed. 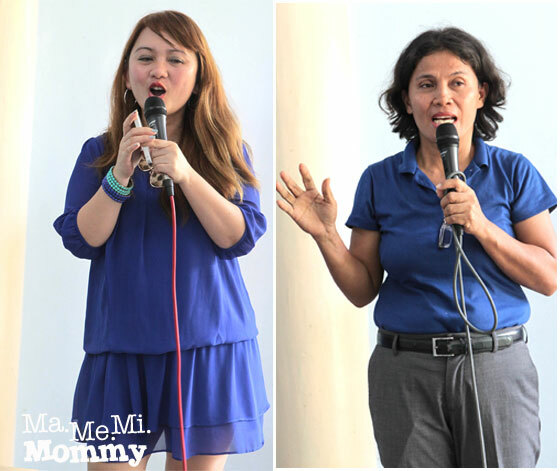 Last August 23, 2014, it welcomed both media and bloggers to take a tour around its facilities and introduced to us two of its most famous residents, both of whom have starred in Hollywood’s blockbuster movies. Wow, right?! 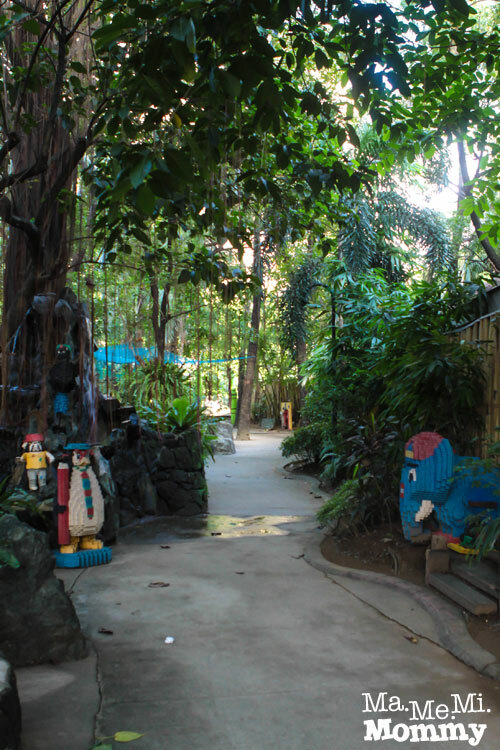 From Manila Zoo’s main entrance, turn left to enter Kinder Zoo Adventure Jungle. There’s a separate minimal entrance fee for this facility. You can check out the prices at the end of this post. After entering the gate, we found ourselves in this cool shaded pathway with colourful LEGO animals to greet us. The program started with DJs from DZME 1530 Radyo Uno building rapport with the audience as they enjoy the sumptuous buffet. 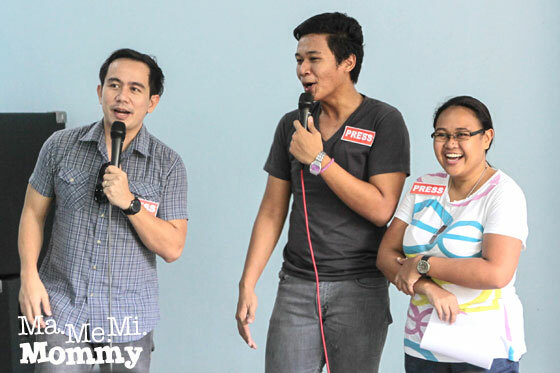 CreatiVoices CEO, Voice Master Pocholo Gonzales (left) also joined them and wowed the crowd by doing voice impersonations of popular animal characters like Pong Pagong, Kiko Matsing, Mickey Mouse, Donald Duck, Goofy, and Barney. These pretty birds were just perched on the trees, free to roam, free to play. There’s the grass owl on the left, lady birds on the right, and the colorful Toucan at the bottom. There were also tortoises (land-based turtles) doing uhm, something. 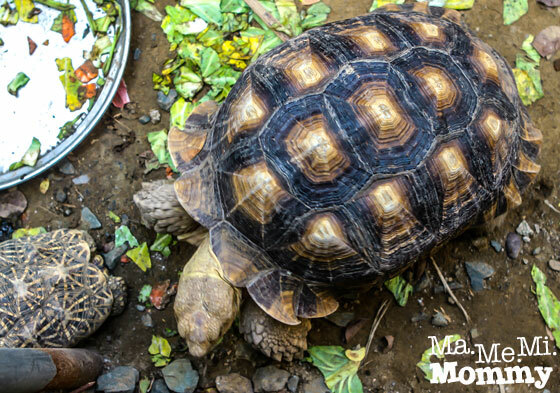 These are the Indian Star Tortoises. They are usually found in dry areas and scrub forests in India and Sri Lanka. 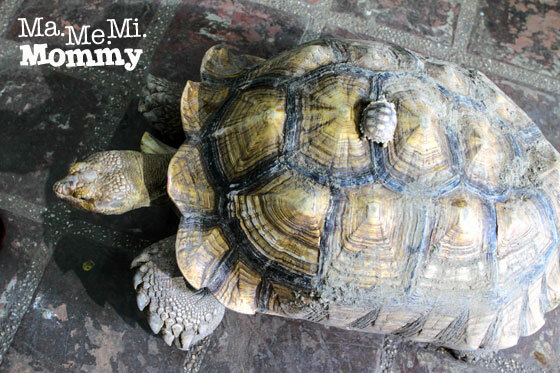 They got the star on their name from the black and yellow radiating streaks pattern on their shells (seen more on the smaller tortoise on the left). There were also animals that the guests can take a ride on. The birds were very tame and well-trained to perch on guests’ arms. Here, both kids and kids at heart take turns in getting a photo with the white Cuckatoo. 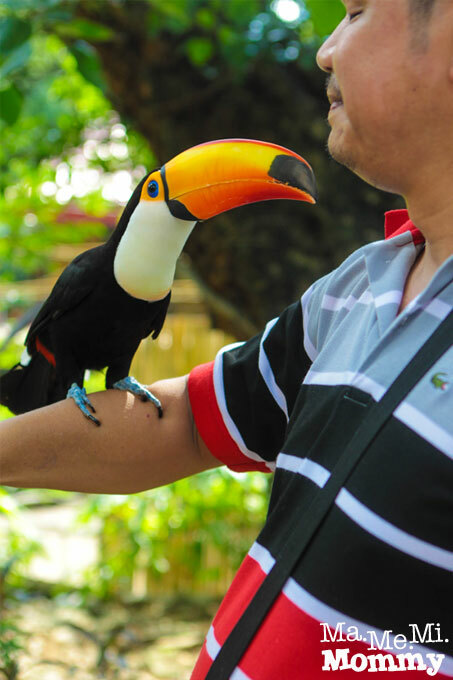 Here, a man braces for a lips-to-lips with the friendly Toucan. Guests were allowed to feed the birds, with dietician approved food, of course. The bottom photo shows a woman throwing banana pieces to the birds. 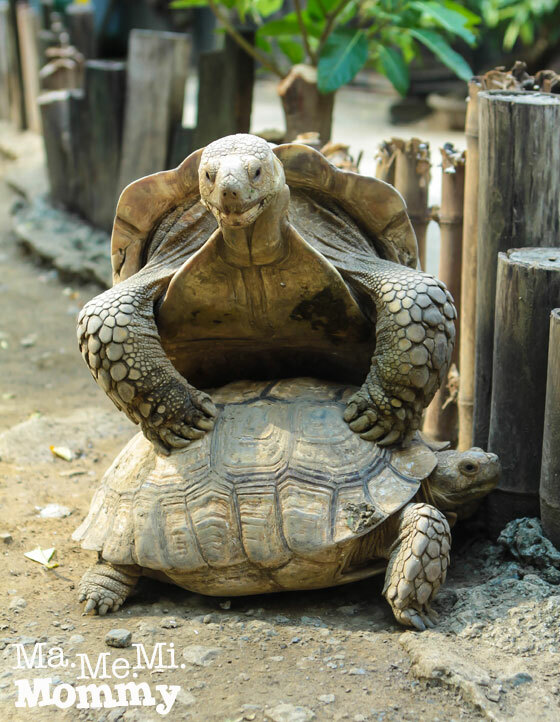 There’s DA knocking on the tortoise’s hard shell. 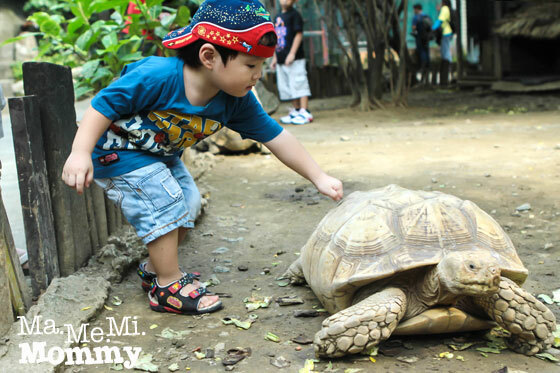 Guests were encouraged to touch and feel the tortoises shell but never to sit on them. 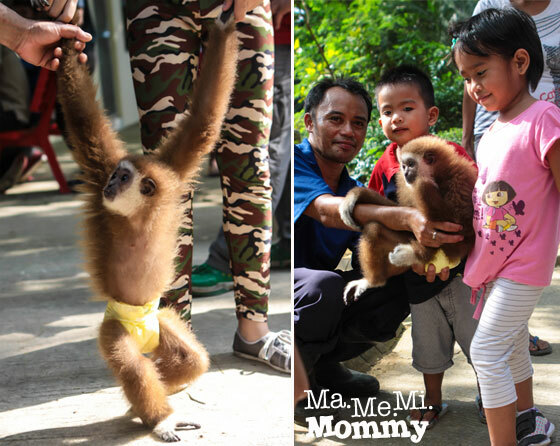 Aww, this Gibbon is just too cute with his yellow diaper. When he’s not monkeying around, he also gets a photo op with the park’s young guests. Here comes Mr. T, carried by 2 personnel. Yes, he’s that heavy! 50 years may sound like a long time already but these Sulcatas can live over a hundred years, with the oldest recorded at 182 years old! Wow, I feel so young! 🙂 Their shells can grow to over 1 meter in length and they can weigh over 40kgs. They eat grass, plants, and cactuses. 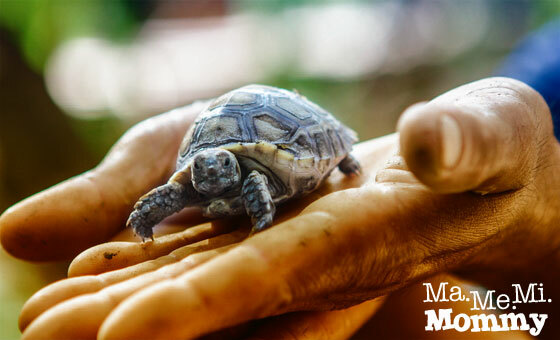 Unlike regular turtles, these tortoises are not shy and actually look forward to being with humans. They love being fed but do be careful with their sharp beak. 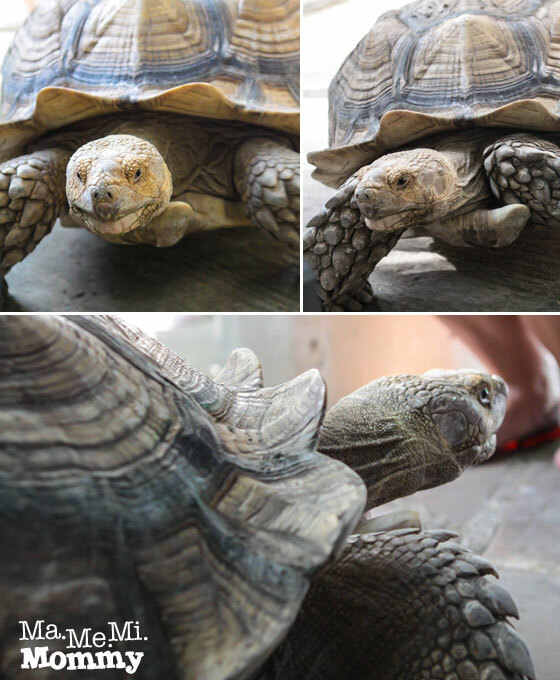 Here’s a closer look at Mr. T.
Kinder Zoo has been successful in breeding these tortoises. 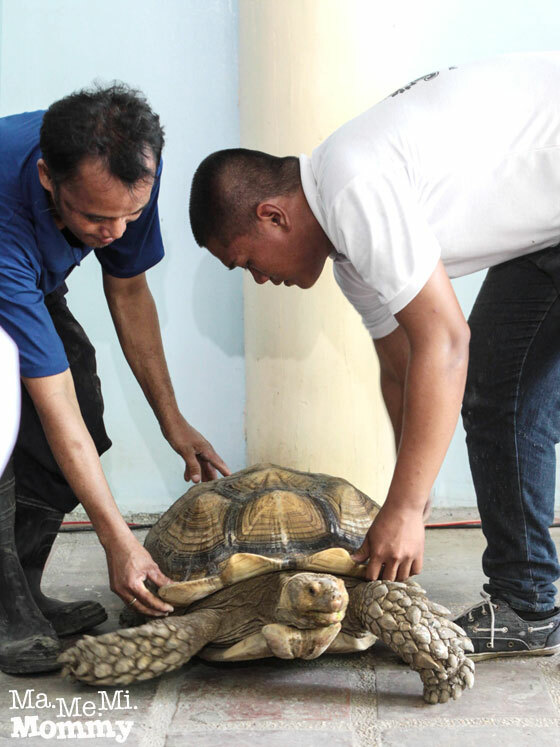 Here, a 4-month old baby Sulcata Tortoise was placed on top of 50-year old Mr. T.
DA with Mr. T when the latter was back in his environment. Meet our second guest. 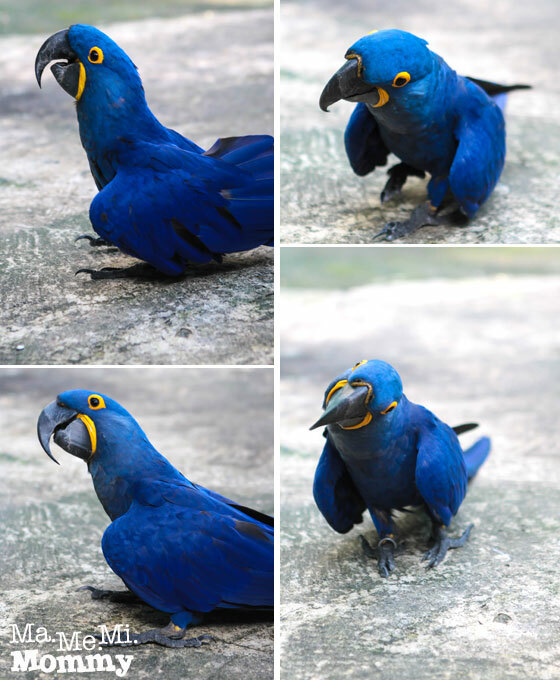 Which movie have you seen this smart looking BLUE parrot? Right you are! It’s in the movie Rio! Well, to be really accurate, the ones in the movie were Spix’s Macaws and this beauty here is a close relative. 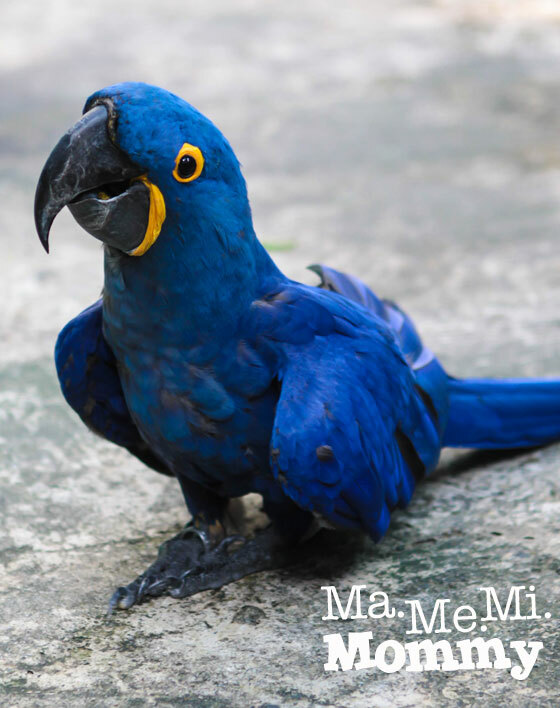 Kinder Zoo is proud to conserve 7 Hyacinthe Macaws in its facilities. These macaws, native to Brazil, are the largest flying parrot in the world. Sadly though, they are considered endangered, numbering approximately only 4,000 in the wild. Mommy, can I take one home? Puh-lease!! 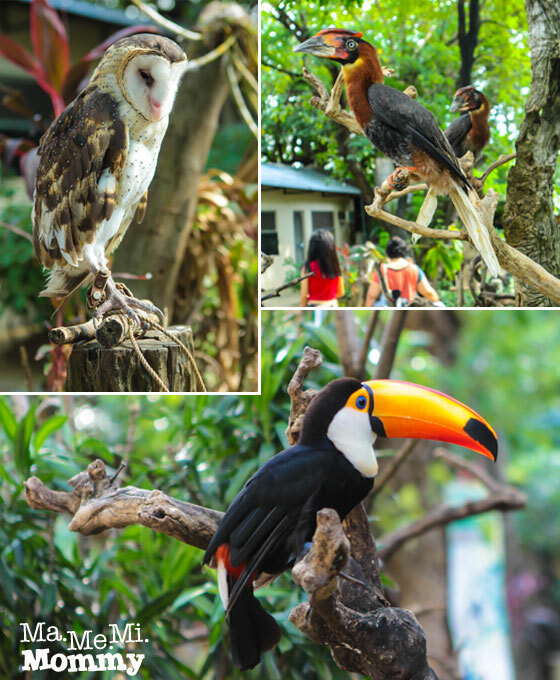 Oh and did I mention that these birds are at a whopping P800,000 each? This is their caged aviary. It’s amazing how they immediately fly to you when you stand by their cage. Be careful of their beaks though as they are powerful and have a crushing strength of 3000 pounds per inch. 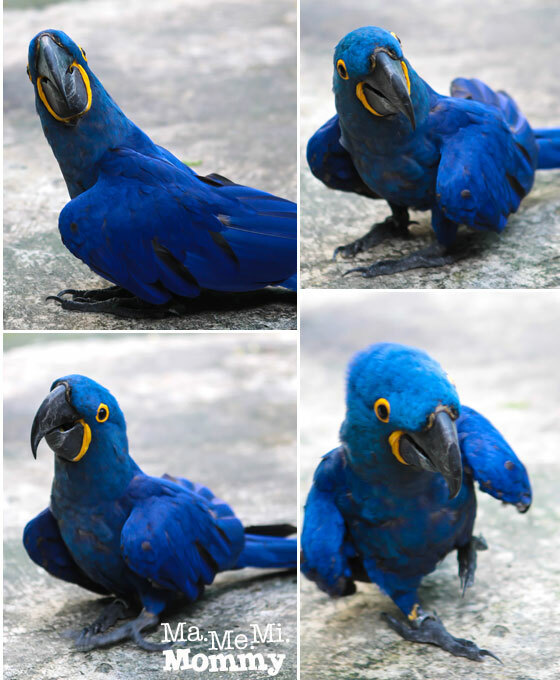 The 7 Hyacinthe Macaws have called this home for the past 5 years, growing and maturing into adult birds. 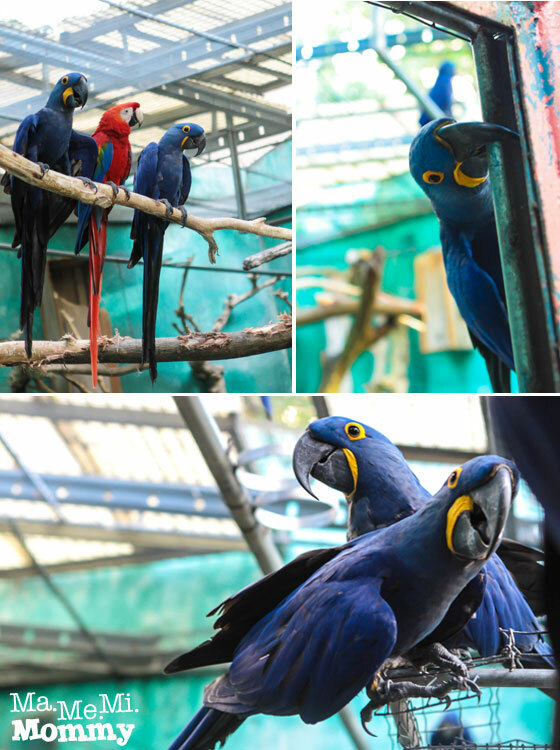 Sometime this year, Kinder Zoo will no longer display the Macaws that have paired up and will set them up for breeding in its new breeding facility. Awww… So be sure to catch them while they’re still at Kinder Zoo! 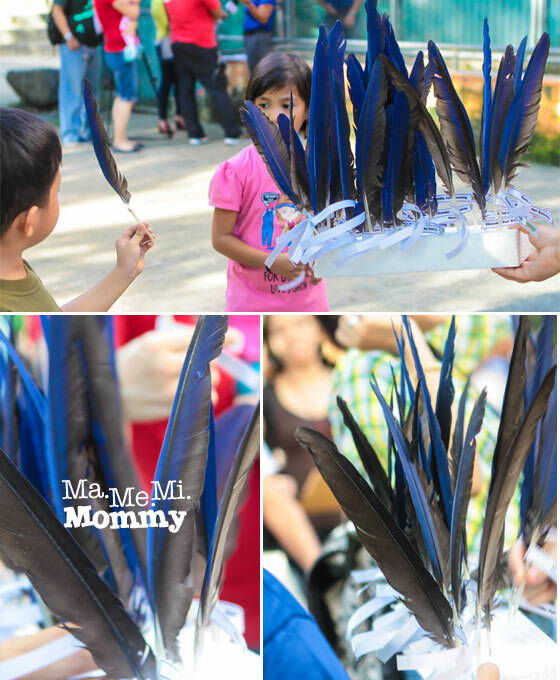 After the event, we all got to take home souvenir Hyacinthe Macaw feathers. Nice! We’re all a tiny fraction of P800,000 richer. LOL! And no, they did not pluck them off the birds, they naturally shed these feathers, if you must know. Finishing the rest of my tour, I saw this wall climbing facility near the exit. 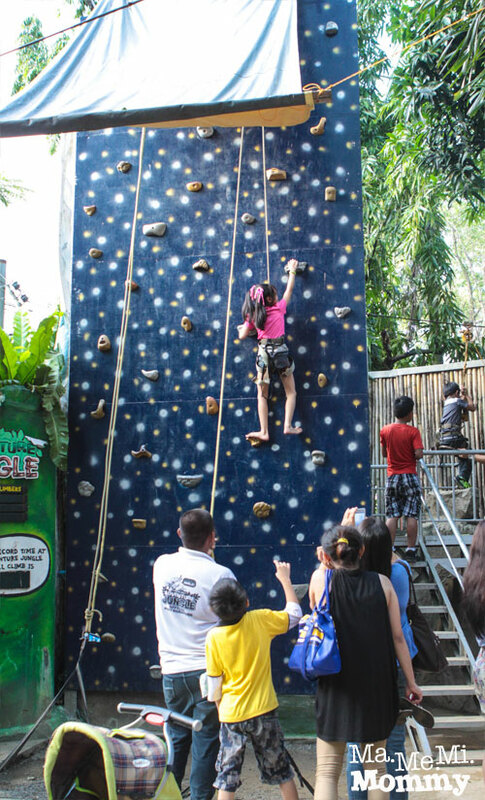 Apart from this, Kinder Zoo also offers other activities like Zip Lining. The entrance fee is just P100 per person. With this, you can already do the basics of taking photos and interacting with the animals. 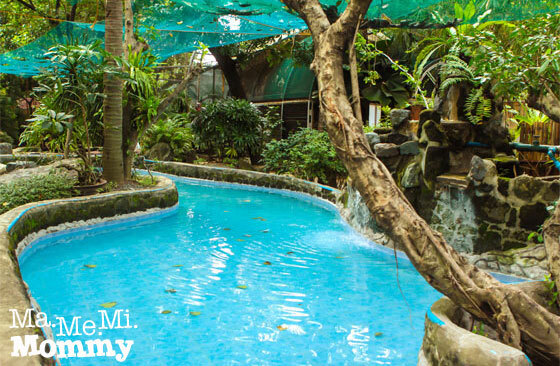 To really maximize your jungle adventure however, you may opt to get their SuperSulit Bundle for only P250 which includes the wall climbing, zip line ride, swimming, butterfly garden, horseback riding, bird, fish, and turtle feeding, and sideway climbing. 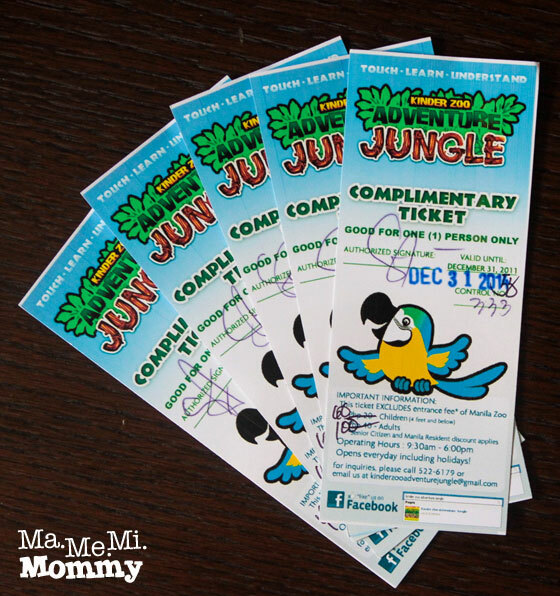 I would love for you to experience the Kinder Zoo fun firsthand so I am giving away 5 tickets to Kinder Zoo Adventure Jungle. 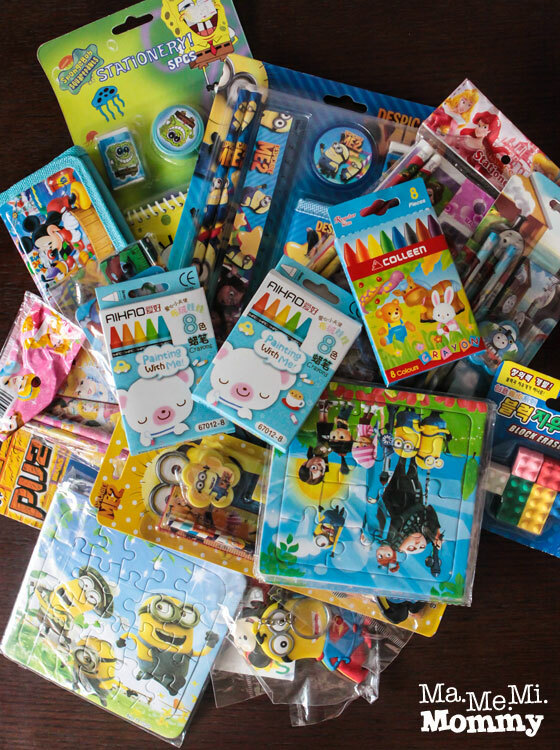 And since my birthday is coming up in a few days, I’ll also throw in a goody bag with lots of kiddie stuffs. Comment your full name, email address, and who you’ll share the Kinder Zoo tickets with on this blog post. P.S. 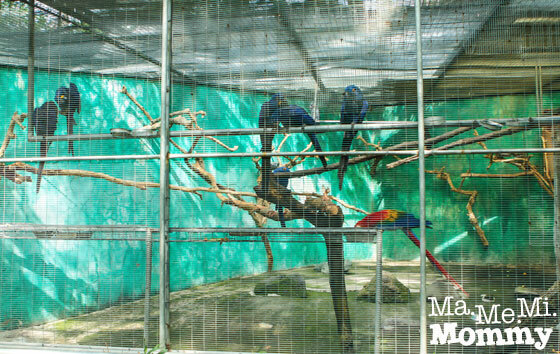 We also visited Manila Zoo to check out the animals there. Photo Gallery here. Glad to read your blog. Been there at the kinder zoo way back when Bea and Sean were just little kids … that was 6 years ago. Hope to bring my kids back there again, this time with Seth and Symon. Great blog, nice pictures too. Will bring my kid n wife there soon. great blog, nice pictures too. Will bring wifey n kid there soon. We’ll e sharing these Kinder Zoo tickets to my two kiddos! Family day out it is! Nice post..I love the pictures..Thanks for sharing this! I will share the Kinder Zoo tickets with my family..we have 3 kids & it will be a perfect bonding time for us! i’d share it with my bestfriend and her son so our kids can bond and be educated at the same time. I intend to bring along my husband, my 6 year old daughter, my 5 year old nephew and my 6 year old niece. Among my 23 nephews and nieces, these 2 are very dear to me. Their father died a few months ago and their mother who is my sister, gave birth to her 6th child just last month. I just want these 2 kids to be happy and to enjoy life that’s why we are spending quality time with them. I’m sure we’ll have a fun-filled experience at kinder zoo if ever. Nonetheless, advance happy birthday! Hi i’m Princess Buenviaje, i will share these kinder zoo tickets to my two kids, to husband and one for me… yehey i’m hoping to win this for my kiddos newest adventure. The place is so nice and very accomodating and i want to experience holding those exotic animals yeah! Feeling braved.*)! Thanks for this awesome giveaways! If I win , i will share this to my cute little nieces who loves animals, actually we have a small bird nest in our yard with 3 different kind of birds, we also have 2 rabbits, 4 hamsters, 3 small turtles/tortoise and 10 different kind of fish. For sure they will be happy to see more different kind of animals in the zoo. They also wish to see the mother of their turtles so by looking at the photos you posted above, they will be in cloud nine once they see Mr. T! HAHA! Also they love the movie Rio and would love to see Blu in person! I will share the Kinder Zoo tickets with my 4 years old daughter Shia Courtney and with my nephew and niece. I’ll share the kinder zoo tickets with my 2yo son and his bestfriend. 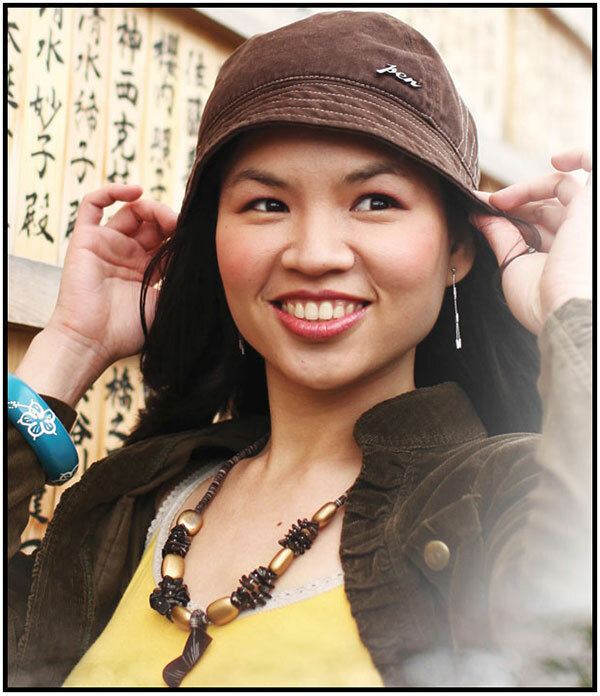 Shanalyn Dela Cruz at shanalyndelacruz@yahoo.com. I want to share these tickets to my daughter who will be celebrating her 12th birthday this September 18 and also some of her friends…It will be a nice birthday gift for my dear child so hopefully I will be one of the winners here in your promo. More power! I want to share it with my kids and pamangkins. They really love animals! We usually go to manila zoo but we never go to kinder zoo bcoz of another entrance. But if I win I really appreciate it. My kids will surely love it. And they will surely happy. Thank you for this giveaway bcoz not everyone can go to manila zoo because of lack of money,but for this promo it was so helpful to us to experience kinder zoo. I’ll share to my kids and my 2 pamangkins. They really loves animal so much especially the birds! 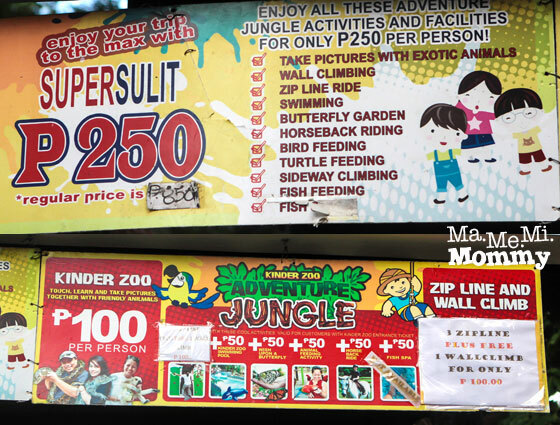 We usually ho to the manila zoo but we never go to kinder zoo because of another entrance. So if I will win my kids will surely enjoy it. Thanks Ma Me Mi MOMMY! I want t share with my niece who love animals.She maybe young but she thinks like adult 🙂 And also I share some of the tickets to my cousins that are on elementary level who are indeed needed for their studies. I will share it with my kid and my pamangkins. I’ll share my tickets with my family, this is a perfect gift for my babies for being good in school. I Will share this kinder zoo tickets to my loving sister nd her little boy,to my little brother and to my other sister ..this is the perfect bonding for us because my nephew nd my little brother never been to any zoo at all so I want to win this for them ..pls let me..they’re for sure become happy if they see those animals..they love animals..godbless more power. Comment your full name, email address, and who you’ll share the Kinder Zoo tickets with on the blog post. His Mom – i love carrying her baby but what if i get tired who will be the next to carry him? haha but its not only the reason why i want her to go with us, i want her to go with us because she’s one of my closest cousin. I will share the Kinder Zoo tickets to my husband, my only kid and two nephews/nieces because we have not been there. I will definitely share this with my kids who have this overwhelming fascination about animals. My little brother, John keeps on telling me that he wants to go to a zoo!!! Happy i read this blog! Buhay pa pala talaga ang manila zoo!! I will share it to my 3 months old daughter, my niece 8 y/o, my nephew 3 y/o, my sister, my mom and dad and my brother. If I win I would share my tickets with my family, especially my little 3 year who loves animals. I am hoping to win so I could treat my family to a place where adventure and fun begins. I’ll be sharing the tickets with my husband, my 5 years old son, my 1 year old daughter, my sister and my cousin who just got here in Manila last month. I’d like to show him Manila and it would be best kung ang dadalhin ko sya sa lugar na alam kong sulit ang oras at minuto nya dito. Yung lugar na alam kong makakapag pasabi sakanya na “the best pinsan ako”. I think eto na yon. Kaya wish myself a very good luck. I will share the entrance tickets with my twin nephews who has never been to the Kinder Zoo. Thank you. September 26, 2014 is a very special day for me and my wife, because it is our 2nd year Wedding Anniversary. I’m truly grateful to have her as my wife so in our Anniversary I’d like to give her a special gift. 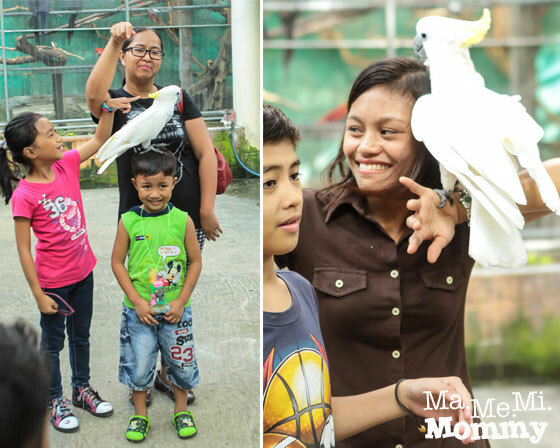 She and my kids loves animals so much so I’d like to bring them to a place where we can both learn more about animals while we enjoy ourselves. I’d also like my kids to be aware of the different animals that we share our world with. It would be a way for them to know why they should someday protect our planet earth. I saw in your blog the fun adventures we might experience when we got there, and I can’t hardly wait. I can already imagine the smile on their faces that would fill my heart with joy. Hoping to win. Thank you very very much. I will be with the whole family to see what you saw. And experience what you have experienced. I share my kinder zoo tickets my Son “KIEL” and to my husband “ERNANI”,with my younger “JANA” sister and “KENJI my husband pamangkin. Wow! I want to share this to my family. Great my niece’s and nephew really loves animals especially my nephew he is like the young version of kuya kim. 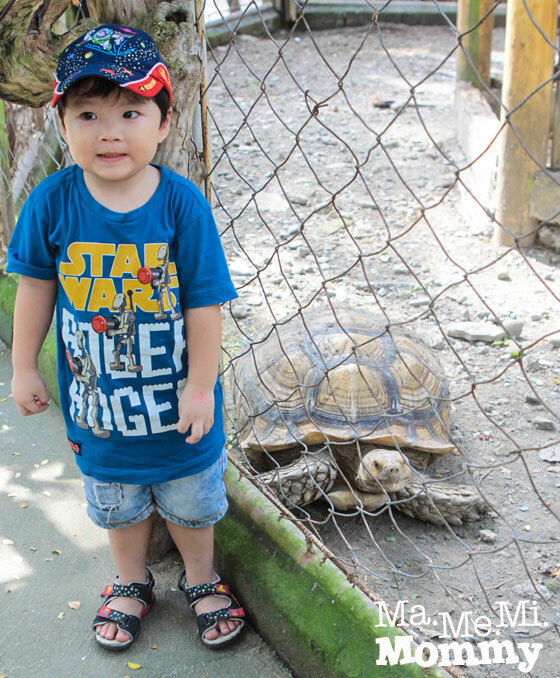 He loves collecting different kinds of animals and he knew almost the name of dinosaurs, lol I bet he will surely enjoyed if he saw those animals in person. GOD BLESS! I wanna share this experience with mu daughter who is 8 years old and my son who is 1 year old. It will truly be a fun and educational experience for them. this is a really cool prize. I will be sharing it with my baby, my mom, my niece and aunt. 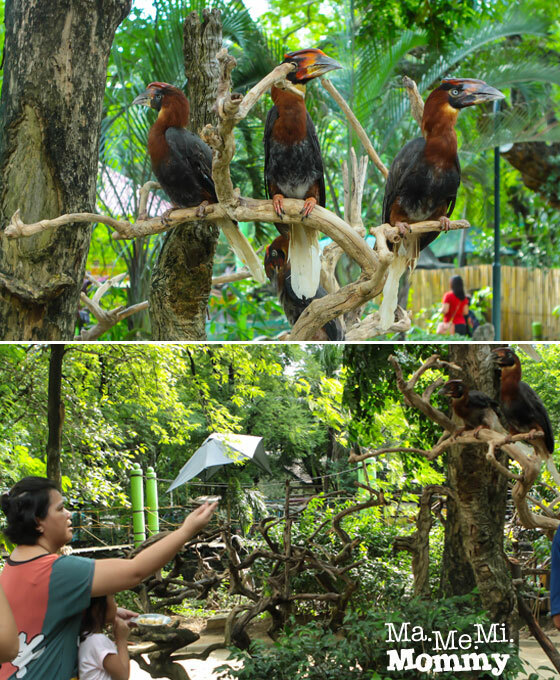 the kids will surely love seeing and interacting with those colorful birds and other animals. they will have a lot of fun visiting that zoo. I will share this ticket with my little brother, my niece, mom and dad. We love animals especially mother earth. Thank you and Godbless! Hi! I so enjoyed this post, thanks so much for sharing! You hit right on the spot with your intro, though I’ve been planning to go to Manila Zoo soon anyway. But the Kinder Zoo is great!!! I’ll bring my kids and nephews and nieces there for sure! If I win, I will share the tickets to my nephews and niece. Im sure they will like it here! I wiil share this ticket to my wife, daughter, son and 1 of my pamangkin, i want them to experienced the this one of a kind zoo…. If fortunate enough to win the tickets, I will share it with my family. My dad, sister, and two baby brothers. I want to win these tickets for my siblings to be educated to different kinds of animals and for them to learn how to care and love these lovely animals. I really want to win these because I want to treat them as well and give them something that they could learn. Thank you! If I will be pick I’ll share the other tickets with my other inaanak hehe pre christmas treat na din for them! nice blog and thanks for sharing your tickets and Happy Birthday!!! If given the chance, I will share 5 tickets with my 2 younger kids, 1 grandson, and to my 2nieces. This is a great chance for us have bonding moments together, and a breaker for us from Manila’s pollution and traffic problem. I would be a happy mom, tita and lola If I get this tickets. I’ll share it with my son and nephews..
As per your blog informations,it seems like we will really enjoy this place!Hope to win! If i win, I want to share the tickets to my daughter because she will celebrating her birthday on September 21,and she will definitely love it. and I will also share it to my partner and to my Dad and Mom. And I would love to share if I win this tickets to my friends who are already teen but we’re always child at heart! It’s always a good and refreshing thing to enjoy the things you do during your childhood years with the people you are with right now. So I’m hoping I’ll win! Thank you & God bless! This giveaway is the one i’ve been waiting for to share to my lovely niece and nephews. Very educational and fun! It’ll be fun sharing the tickets with my 2-year old daughter and 3-year old Korean cousin. Since both of them are toddlers, they will surely love the thought of discovering nature and exploring animals beyond what they see in pictures 🙂 Family field trip at its best! I will share the ticket to my husband and 3 kids. Hope to win as this will be our first time to go here. I know we will enjoy this trip and would have fun memories as we all love animals. Liked the your facebook page! Also read your blog good read! I’m going to share the tickets with my family, 5 tickets goes to me and my partner and other two tickets goes to his ninong and ninang who would go with us on Zoo day, highlight of the trip would be daughter’s first trip to the zoo as she is 2 years old and is very curious on how the world goes. 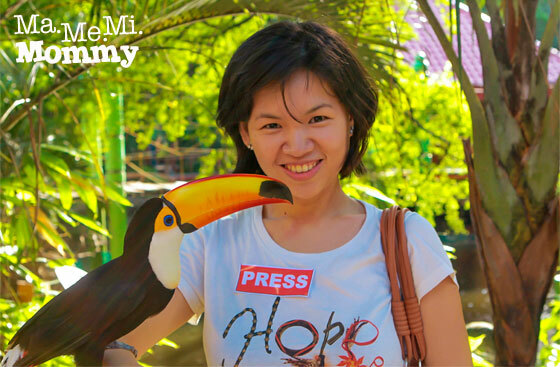 i would like to show her how beautiful Manila zoo and the kinder zoo attraction especially the various animals to see. so please grant me this wish so my family can go to the zoo and enjoy! My son will celebrate his 5th bday on sept 26. ( i think this will be the best gift). So hoping we can win the tickets. I will share the tickets to my favorite niece Luisa, to dadi eric and to my ever loving and supportive mom. Thanks. My niece enjoys animals a lot! She had been to Manila Zoo when she was 2 years old. It would be a different experience now that she is already 4. Also, there will be a closer interaction with the animals at Kinder Zoo. It is more exciting and educational! What more can you ask for? !